It is now official. 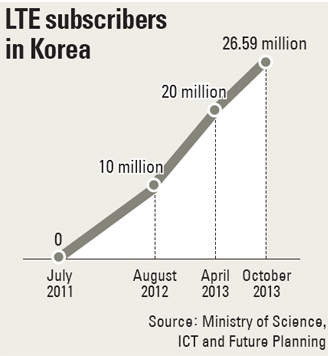 More than half of all South Korea's mobile phone users now subscribe to LTE services. 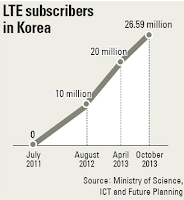 This was not surprising as South Korea has led the world in the rate of LTE adoption, as shown by the accompanying graphic. As reported by The Joongang Daily, "The growth of the LTE service comes with the decline of 3G, the previous standard for wireless communications. According to the ministry, 3G subscribers accounted for 48.6 percent of mobile phone users in Korea in January, the first time they went below 50 percent. In October, 3G subscribers numbered only 19.73 million, or 36.3 percent of mobile phone users. As for the slower 2G service, SK Telecom had only 4.04 million subscribers and LG U+ 4.03 million subscribers in October. KT ended 2G service in January."